Welcome to Ilios of Paros! 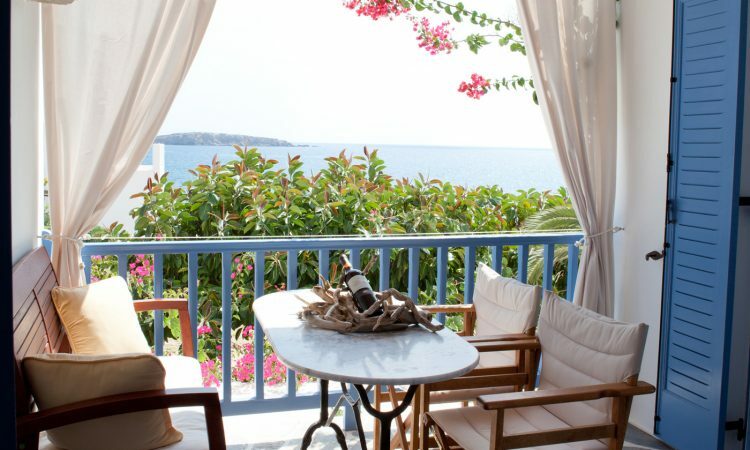 A family-run concern, the ”ILIOS of Paros” holiday accommodation complex is located in Drios village on the island of Paros, directly overlooking the Aegean Sea. Flowerbeds and trees adorn the grounds, and there is nothing to obscure your enjoyment of the sea view while relaxing on your veranda. 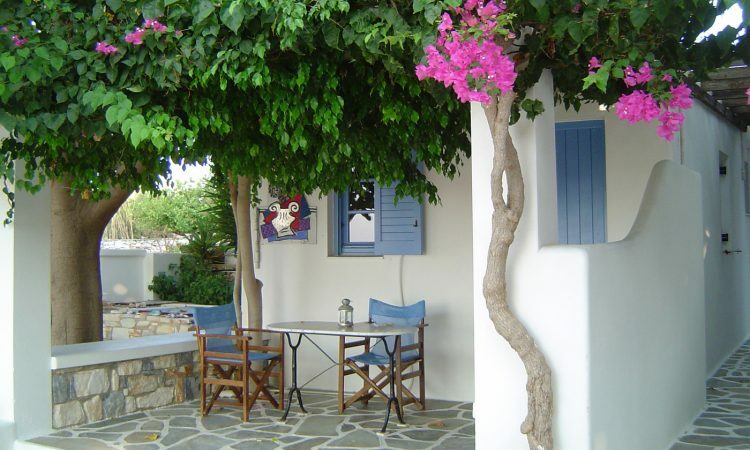 “ILIOS of Paros” is a small traditional holiday complex, ideal for relaxing holidays, situated in a peaceful spot, on the sea front (50 meters from the sea), at walking distance (250 meters) from the center of Drios village. from 70€ per day (low season)! from 65€ per day (low season)! We stayed at Ilios for 8 days and were very reluctant to leave. The only reason we left was to continue exploring the islands. Ilios is more than accommodation. It is like joining an island community. Fanis and Eva were warm and generous hosts and spoilt us with homemade baked goodies, fresh fruit and veggies out of the garden and hosted an evening meal for the 3 families staying there. The units have been decorated impeccably, with Eva's attention to detail. Fresh flowers in the apartment every day, and all the small things that make life comfortable. Washing line, pegs, safe, fly swatter, sewing kit, candles. We enjoyed the private beach in front of the apartments and all the surrounding beaches, walks and tavernas. It will be hard to beat this stay anywhere else. Eva and Fanis were very pleasant hosts who made sure that everything was just as we would like. The delightfully comfortable rooms with all the amenities you need looked out at magical views across the sea. There are no traffic noises and only the sound of birds tweeting could wake you from a daydream ander the Mediterranean sun. 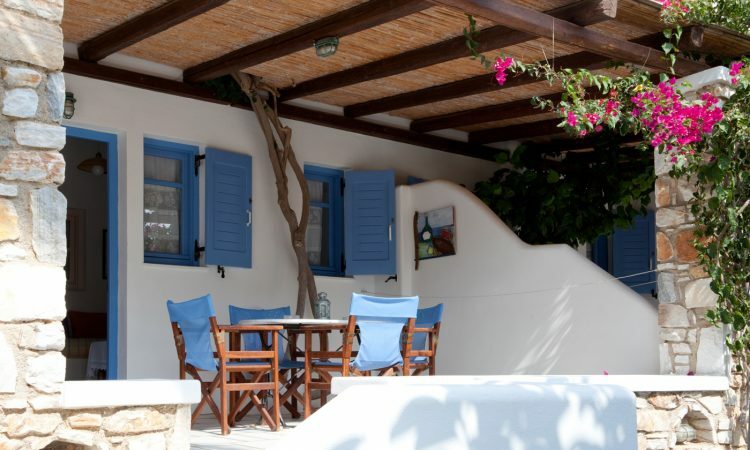 It is only a short walk to a handful of restaurants offering typical Greek cuisine. This was our first trip to Paros and our first visit with Fanis and Eva, but probably not our last. Perfectly relaxing holiday, very well-equipped and comfortable rooms, beautiful garden! I visited Ilios apartments with my boyfriend for four nights in July and had a fantastic and extremely relaxing time. The room was very well-equipped, including a kitchenette that had everything we needed to cook breakfast or a small meal. Our veranda was absolutely fantastic, with a very comfortable seating area overlooking the beautiful garden and the sea. Our hosts clearly take an extremely good care of the garden, which is full of colourful flowers, and has some additional common seating areas as well as hammock and two swings. Our hosts made us feel very welcome, and Evangelia treated us with delicious home-made cakes and cookies. Drios is a great place to stay in Paros if you have a car or a motorbike, because it is far away from the over-developed and over-touristic areas of the island, and apart from the great strolls you can do in the village, it is close to some fantastic beaches (such as Faraggas, but also other beaches without names that you can discover by exploring with the car) as well as other picturesque small villages with great fish tavernas (such as Pisso Livadi). Ilios of Paros: un posto magnifico. Struttura molto curata, spazi comuni piacevoli, appartamenti spaziosi e funzionali, posizione tranquilla, pulizia impeccabile sia degli interni che degli esterni, ma soprattutto una gentilezza e un senso dell'ospitalità da parte dei proprietari straordinari. Endroit magnifique au calme dans un cadre enchanteur, très belle vue directe sur la mer de tous les appartements. Acceuil chaleureux de Fannis et Eva qui sont aux petits soins et font tout pour rendre le séjour agréable Décoration soignée, très propre et on trouve tout ce qu'il faut dans les appartements même une boîte a couture. La literie est haut de gamme Super endroit pour se reposer, dans le village un super market a proximité et de bons restaurants. Abbiamo soggiornato per 11 notti in questi studios e tutto quanto è stato perfetto. Gli appartamenti sono belli, puliti e dotati di ogni confort si possa desiderare. Comoda la spiaggia più grande e famosa dell'isola (golden beach, 15 minuti a piedi dagli studios), vicini molti locali per bere e mangiare bene. In pochi minuti d'auto o scooter si arriva a Parikia, Naussa o nei centri minori ma non meno belli (Lefkes, Piso Livadi, Marpissa) e nelle altre spiagge dell'isola. La famiglia che gestisce l'attività è di una gentilezza e una disponibilità rare. Fanis e Eva con la figlia Barbara sono persone eccezionali, in grado di far sentire i loro ospiti a proprio agio, qualunque ne sia la provenienza o l'età. I dolci che Eva prepara e offre a tutti, la frutta ed il vino che trovi nell'appartamento, la disponibilità a venire incontro ad ogni esigenza per cercare di rendere il soggiorno il più bello e sereno possibile: queste sono le cose che trovano gli ospiti di ilios of paros. Non è un caso che molti dei clienti che abbiamo incontrato siano assidui clienti, anche da 10 o 15 anni. Un soggiorno che non si scorda. Die kleine Appartmentanlage ist traumhaft schön! Sowohl die Appartments selbst als auch die Außenanlage befinden sich in einem absolut ordentlichen, gepflegten Zustand wie ich es selten erlebt habe. Alles ist sehr praktisch, aber gleichzeitig auch sehr liebevoll eingerichtet, sodass man sich einfach wohlfühlen muss. Es war alles vorhanden, was in anderen Appartments häufig fehlt: genügend Stauraum, viele Haken, ausreichend Handtücher, Fön, ein Safe, Nähgarn ... Das Meer zum Baden und Schnorcheln lag direkt vor der Tür. Der Strand, ein kleiner Kiesstrand, war selbst in der Hochsaison (Mitte Juli) kaum besucht. Das Wasser war glasklar, es gab keine störenden Geräusche von Motorbooten oder Ähnlichem. Als wahren Luxusfaktor der Anlage haben wir außerdem die Außendusche, die Hängematten und die Liegen empfunden. Es gab kaum noch einen Grund, die Anlage zu verlassen. Als Eva uns dann noch - zur großen Freude meiner Söhne - mit köstlichem, selbstgebackenen Kuchen und Obst versorgte, war das Glück einfach perfekt! Mit dem Bus besuchten wir die nahe gelegenen Orte, zu Fuß gingen wir an den größeren Strand (Golden Beach) zum Windsurfen. Abends gab es in der Nähe eine nette Auswahl an Restaurants und Tavernen, für jeden Geschmack - auch für meine Teenager-Jungs. Fazit: Bei Fanis und Eva haben wir uns sehr, sehr wohlgefühlt. Die entspannte Atmosphäre von Ilios hat sich auf uns übertragen und wir haben uns wunderbar. Absolut empfehlenswert! 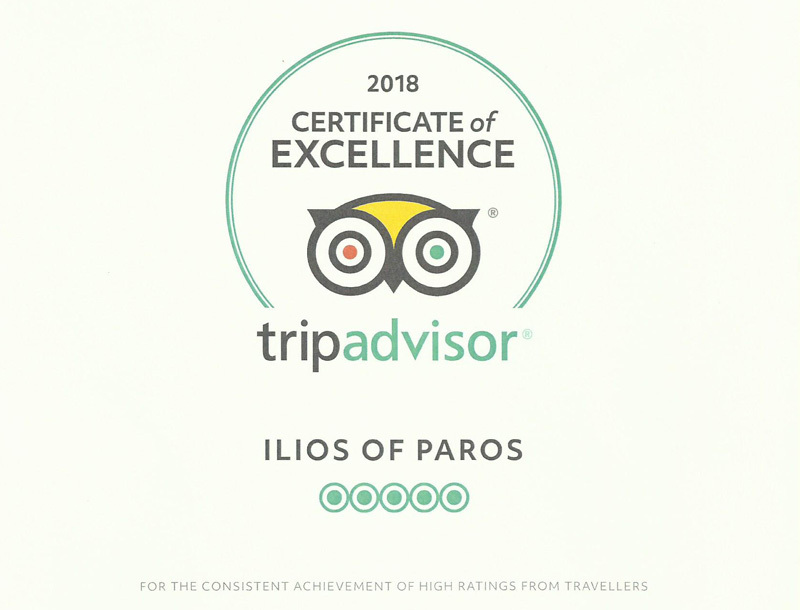 We visited Ilios of Paros in June and were very happy with our choice. 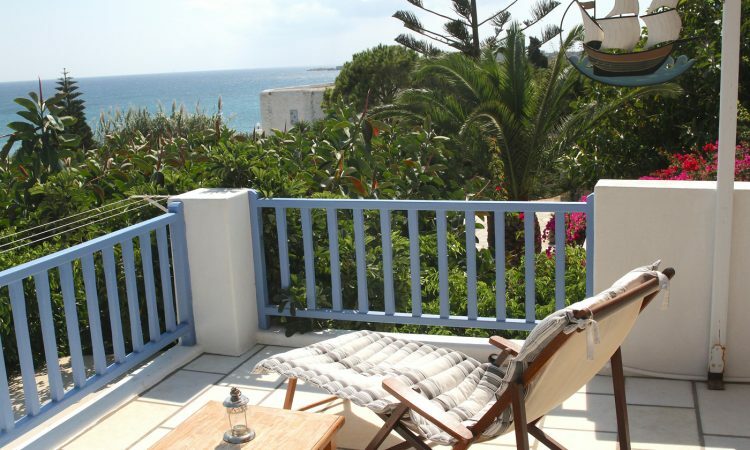 Eva and Fanis have great apartments near the sea. Very clean, cosy and well equipped. Eva spoiled us the whole week with pastries, fruit and attention. It was very quiet on the island and we'd recommend hiring a car because the buses don't go very often this time of the year. If you want a relaxing holiday on an island with sweet people, warm weather, clean seas and great food: visit Ilios of Paros. Ho trascorso due meravigliose settimane in questi studios. Non è la prima volta che vengo nelle Cicladi e devo dire che gli allogi sono estremamente curati e confortevoli. Il posto è bellissimo e lontano dai centri maggiori di Parikia e Naussa, ma vicino (1km) alla 'Golden Beach' che è ideale per chi vuole una spiaggia di sabbia con acque basse, dove comunque esistono strutture per praticare sport acquatici e taverne.Proprio davanti agli studios si apre una bellissima caletta, dove non è raro essere i soli a fare il bagno. Fanis, Eva e Vassilis sono dei padroni di casa eccezionali, gentilissimi e disponibili e mai invadenti. Sono stati carinissimi con noi e i nostri figli, ci hanno sempre offerto cibi deliziosi e hanno risposto a qualunque nostra richiesta, giorno e notte! Consiglio a tutti di andarci, possibilmente noleggiando un mezzo (scooter o auto) perchè Paros è stupenda e merita di essere esplorata. My wife and I spent four days at this wonderful accommodation in Drios. It was our first stay,but we will return in the future. Fanis and Eva were wonderful hosts who we enjoyed interacting with. They were always available and supplied home made treats on several occasions. Everything a traveler requires is within a short walk and a pebble beach is right in front of the resort. Our unit was well furnished with a kitchen, wifi, TV, A/C, etc. Those travelling by bus will find the unit a short walk from the Drios stop with many daily connections to Piso, Naoussa and Parikia. This is an excellent place for families as well as couples to spend their vacation. Great Place! Very clean and nice studios all with a wonderful sea view. Studios have a full equipped kitchenette, a spacious balcony or garden. Fanis, the owner, is the kindness himself..and his wife Eva is the cake's queen!... They are always helpful, they make your staying unforgettable! As they have a little beach toys storage available for all baby guests, our little son, Lorenzo, had a lot of fun ! Very hard leaving this place....and come back home!!! I had an absolutely great time @ Fanis and his wife Eva. Freshly baked cakes as a surprise in the room, information at any time, easy payment, wind protected breakfast on the terrace with sea view, well maintained and proper place, quiet an easy - I had it all. Efcharisto Fanis&Eva! Fantastic place to stay. On the seaside, we had an amazing seaview on the second floor. And oh so Nice owners! Very clean rooms, beautiful garden. We received every day some nice homemade sweets. Lovely! It is hard to add anything to the numerous five star reviews already posted other than to say they are all true! 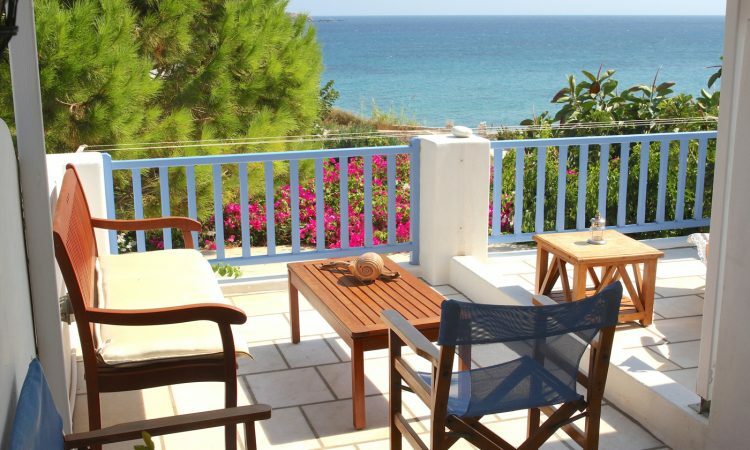 If you are looking for a quiet, well equipped self catering apartment, moments from the sea, run by the friendliest, most helpful hosts imaginable then look no further, Ilios is for you. We have stayed in many self catering apartments over the years and whilst it is basic there is everything you need and we can honestly say it is one of the best equipped and thought-out we have found. There is everything in the kitchen you could need although the local restaurants (especially Anna’s) are excellent and inexpensive; comfortable beds with great lights for reading should you want to and plenty of hooks in the bathroom to hang clothes and towels, something frequently lacking in the very best of hotels. Both the apartment and the grounds are kept to a high standard and cleaned every day. Couldn’t be faulted! So sad to be leaving this outstanding place after a week of delicious tranquility. Eva and Fanis went out of their way to attend to our needs with gracious hospitality at all times. Eva kept offering amazing home made treats and Fanis was a great help advising us about local transport, local restaurants etc and what the points of interest were on the island of Paros. The seaside position was perfect for frequent swimming from early to late and the small pebble beach a welcome change from sandy beaches in our case although swimming with some water shoes / sandles is recommended. 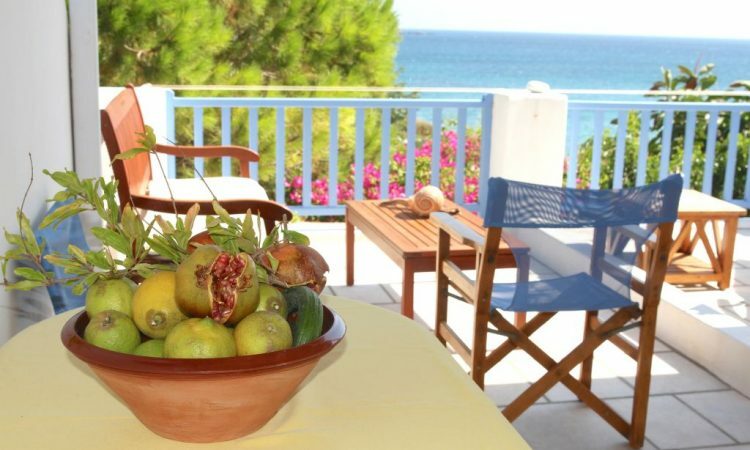 The apartment and grounds were all meticulously maintained and we highly recommend a stay at Ilios of Paros. Am sure we will try and return!